They grow up so fast don’t they? 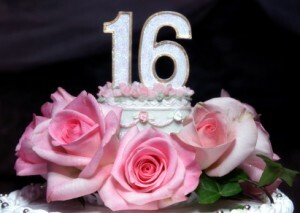 Your sweet little daughter is well into her teens and turning the big one-six. Maybe she wants a more modest party with a few friends or maybe she wants to throw a party straight out of MTV’s My Super Sweet 16. Either way, hiring a DJ as the entertainment is the best way to ensure a successful party. That is, assuming you know how to find the right DJ for your daughter’s sweet 16. Don’t worry, I’ll teach you how. What’s the difference between a hobby DJ and a professional DJ? The only difference is price, right? Wrong. In 15 years of DJing, this was a big disappointment I had with prospects. I refused to drop my price simply because a hobby DJ was willing to do a party for $50/hour. It’s nothing personal against the hobby DJs, and I don’t blame them for trying to get their foot in the door and some gigs under their belt, but I felt bad for the parent who was running a huge risk in the attempt to save a few dollars. What could go wrong with a cheap DJ? Now that you’re absolutely terrified of hiring a cheap DJ, keep in mind that all professional DJs began as cheap DJs. Everyone had to start somewhere. It’s up to you on how much risk you will tolerate. If your daughter’s sweet 16 is a party at the house, and there’s a contingency plan if the DJ doesn’t show or his/her equipment fails, then you’re not running much risk. If you booked out a $15,000 venue downtown with nothing but a DJ to entertain, you should mitigate as much risk as possible by paying the cost of a professional. Ask for a reference who has no relation to the DJ, and who hired them for a sweet 16 party. Call them and ask them how things went. Professional DJs have websites. DJs tend to be do-it-yourself types, so go easy on the design. Pay more attention to the content, images, and videos. Web testimonials are nice, but aren’t always true. Be sure to speak with a reference over the phone. The older their website is, the more likely it can be trusted. Search their domain on domaintools.com to see how long their website has been around. See if the images on their website are from their own events, or taken from other websites. Download an image from their site, and upload it to Google Image Search to see where else this image is found online. Maybe they purchased the image, maybe not. Either way, you will want to see pictures of actual events they performed at and their equipment. Seek out what people are saying about this business online. Pick your favorite search engine and search for “company” reviews and “company” complaints”. Most people who enjoy a DJ’s performance don’t leave a review, but those who are unhappy do. If you see negative reviews online for your DJ, ask them about the incident and give them the opportunity to explain their side. Also look out for overly positive reviews, as any DJ can leave a review of their own service. My biggest tip is to go with your gut, and make sure you speak with the DJ who will be working your event. If you get a bad feeling about him over the phone, call someone else. After it’s all said and done, you’ll have put plenty of hours and money into this event and you don’t want to run the risk of a bad DJ ruining your daughter’s night. Orangeman Productions can provide a DJ for you but with the tips above, you should have no problem finding a great sweet 16 DJ.